My great-great grandfather was Thomas George Martin. He was born in 1829 in Yorkshire, England, the son of Thomas Martin. I have no information for Georges' mother. They immigrated to Canada and settled near Acton, Ontario. I also do not know if George had any brothers or sisters but imagine he was the oldest boy as he was named after his father. He married Hannah Elize Swackhammer February 12th of the year 1850 in Acton, Erin Township, Halton County, Ontario. Unfortunately the census records for 1851 did not survive but I was able to find him in those of 1861 as follows. The couple were living in a log house and George was shown to be a farmer, with his wife and five children. The next census in 1871 we see that the family has grown. All the children are still living at home, with the exception Thomas Palmerston who would have been about 12 at the time.The family has grown to eight and from the dates of birth it shows that Hannah was pregnant with her youngest. Georges' 68 year old father is living with them which would imply he was a widower. They are recorded as Disciples of Christ. The full record for George Martin, found in the 1877 Atlas gives us their exact place. They live in the Township of Erin, County of Wellington on the farm designated as Concession 3 lot 2. The farm is 100 acres in size. George Martin was the Reeve of Wellington County Council from 1864 to 1868 as stated in the History of Erin Township. George Martin was the Reeve of Wellington County Council from 1864 to 1868 as stated in the History of Erin Township. Erin Loses an Old Settler. By the death of Mr. George Martin, on Saturday, Erin loses one of its early and highly respected settlers. His trouble was cancer in the stomach. Mr. Martin was born in Yorkshire, England, 59 years ago. He came to America with his parents when but a child, and settled in the United States. Fifty years ago they came to Canada and settled on lot 2, con. 2, Erin, the present home of Mr. Robt. Johnston. Subsequently he purchased the present homestead, lot 2, con. 3, of the same township. Mr. Martin was a man of more than ordinary intelligence in his day. He was for a number of years a member of Erin Council and sat as Reeve for one year at least. The funeral on Tuesday was one of the most largely attended ever seen in his section. The services were conducted by Elders Fowler and Crewson and Rev. J. W. Rae, and the remains were interred in Churchill Cemetery. Hannah Elize (Eliza) Swackhammer was Jacob Swackhammer and Mary Maria Thompson's fifth daughter and sixth child, from a family of two boys and eleven girls. Hannah was born March 1st, 1828 and therefore a year older than her husband George. Even though they lived in different counties, George in Wellington and Hannah in North Esquesing, they were neighbours. Both farms were practically on the county lines. Hannah, my great-great-grandmother and George were married the 12th of February 1850. The wedding would have taken place at the "Swackhammer Farm" as Jacob Swackhammer had erected a church, cemetery and school on the northern part of the farm that abutted the county line. Hannah and George had nine children over their lifetime together; three boys and five girls. Thomas “Palmerston”, 1849 - unknown, France Sophia, 1851 -1918, Mary Emeline, 1853 - unknown, Sarah, 1857 - unknown, George “Nelson”, 1859 - unknown , Jacob “Frederick”, 1867 - unknown, Elizabeth Victoria, 1870 - unknown, and Caroline Drusilla, 1872 - 1901. Hannah's husband died in 1889, when their youngest was seventeen years old. By 1891 Hannah, now a widow of 61, remained on the farm with five children and 2 grandchildren. Frances Sophia, my great-grandmother had left in 1872 to marry James Ryder, and Mary Emeline had married Donald Mann in 1879. Sarah was married to Charles Alexander not long before. The rest of the children remain unmarried and the two grandchildren present are a 10 year old son of Emma's and a 6 month old of Sarah's. 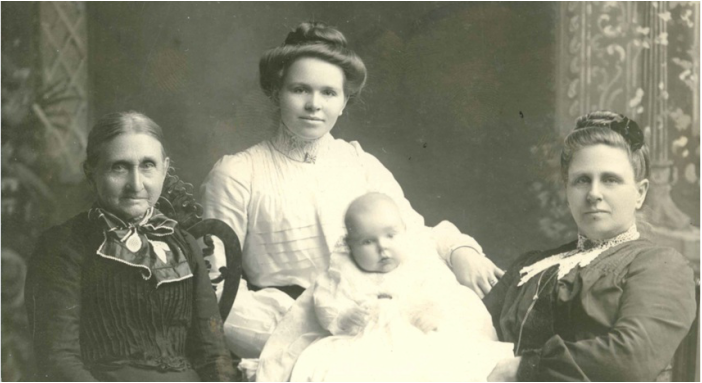 In 1901, the children all married and gone, we find Hannah living with her son-in-law Norman Smith, grandaughter Annie age two and grandson George, six months old. Her daughter Caroline had died. I am not sure if they were living on the farm or if she had moved in with them to care for the children and her youngest daughter. The remains of Caroline D. Martin, daughter of the late George Martin, Erin, and wife of Mr. Norman Smith, Acton, were tenderly laid to rest in thefamily plot at Churchill Cemetery last Wednesday. The funeral was conducted by Rev. James McLeod, the pastor of deceased, and Rev. H. A. Macpherson,and was largely attended. Deceased had been ill for some time and died on Monday, 28th January. She leaves a sorrowing husband and two motherless children to mourn her departure. Hannah is found to be living with her son Palmer and his wife Marianne and their three children in 1911. The family now resides in Acton. Palmer and one of his sons are working as labourers. A long obituary appeared in the Acton Free Press December 5th 1918. "IN MEMORIAM OF MRS. GEORGE MARTIN - Ninety years ago in the pioneer days of this community, a wee daughter was born in the home of the late Jacob Swackhammer, of Swackhammer's Hill. Last Thursday, after a pilgrimage of four score years and ten, spent almost continuously within sight of her birthplace, this elect lady passed peacefully away. She never had any serious physical illness and was able to eat a hearty breakfast and enjoy it the morning of her death. The tired machinery of the human frame ceased and the soul took its flight. About seventy years ago deceased was joined in wedlock to the late George Martin and they settled on lot 3, third line, Erin not a mile from her father's home. Here Mr. Martin died twenty-eight years ago. From that time until five years ago, she lived with her son , Thomas P., for a time on the farm and since in Acton. Mr. and Mrs. Martin ministered in tender and loving care to the widowed mother for over twenty years. Five years ago she went to live with her daughter, Mrs. Archibald Black, at Kelso and here also she received a devoted daughter's attention. It was her she died. The body was brought to Acton to her son's residence and there the funeral service was conducted by Rev. Mr. Jones on Saturday afternoon. Interment took place in the frailly plot at Churchill Cemetery, within a few yards of her birthplace. Mrs. Martin was the mother of three sons and six daughters, of whom the following survive: Mrs. James Ryder, Toronto; Mre. Arch. Black, Kelso; Mrs. Leslie Thurston, Gloversville, NY; Nelson and Jacob at Vancouver, BC; and Thomas P., in Acton. Mrs. Martin was a fine motherly Christian woman and enjoyed the esteem of everybody. she was a member of the Disciples Church and a regular attendant at Everton and Acton for many years." * Tombstone photographs thanks to the "Canadian Grave Marker Gallery"